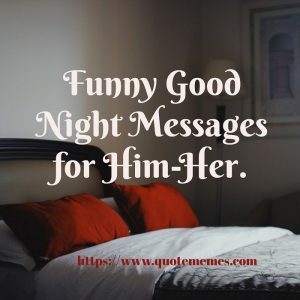 Make him or her feel you always think about them by sending one of these beautiful collections of Funny Good Night Messages for Him-Her. Sweet dreams good night to you all. 1. Lay back, relax and have a good night, let’s see how the rest of the night goes! Fingers crossed! 2. Goodnight, sleep tight and do not mind the alarm clock until 10 am! 3. Here’s to the time of the day that is meant for resting and not meant for texting! So goodnight! 4. Hey it is my last hour of the day and I can remember you, so be sure to have a good night rest my loving husband. 5. The night is short when you are tired and when it is going to be a long day tomorrow. So stop wasting time and go to sleep! 6. The night is here, so you get a chance to travel the world, and eat all you are craving for! Good night my love. 7. It seems I have been kidnapped by my bed, pillow, and blanket, but I do not need rescuing! Good night darling. 8. Do you want to be a billionaire? Now is your chance! Just fall asleep thinking about it! Good night love. 9. Now that it is bedtime, I just realized I have been sick all day and sleep has become my wholesome remedy! 10. Bring all the conversations to a halt! For it is time to sleep! Good night beloved husband. 11. My phone screen is really sticky right now because the kids have been pinning kisses on you through my screen! 12. Mosquitoes make me get out of bed here! And not the inspirational quotes! What about you over there? 13. I am reminded of how wonderfully blessed I am to have you in my life. Good night honey! 14. You are the one I want to retire for the night with and not these damn bedbugs! I miss you, babe. Goodnight. 15. Safety is when I get to sleep next to you every night. Goodnight my beloved husband. 16. Goodnight to the world’s best husband! Have a hitch-free night. I love you, honey. 17. Goodnight to the moon of my life. See you in the morning! 18. I cannot wait to see you in the morning! Goodnight darling. 19. Have a good rest fear not my love, dream of me; not your boss, not your desk at the office, and not your favorite football team! 20. You are by my side at night, so I do not consider my night as dark and scary. Goodnight baby. 1. Sometimes I wish the moon and stars can be bribed so they can be out for a longer time, and so we can sleep for longer! Goodnight my loving wife. 2. Oversleeping is like an offense, and the policeman on the case is known as a sergeant alarm clock. So good night, and take care babe! 3. Goodnight and let my chest be the pillow to give you comfort, and my arms are the blanket to keep you warm throughout the night. Now how can I sleep myself?? 4. The day is over, and so is the internet today! Have a good sleep, my darling wife. 5. Goodnight my love, remember that snoozing the alarm is allowed but snoring is not allowed! 6. Put your phones to rest, put your head to rest, and bring your eyes to a close! Goodnight my beautiful wife. 8. I am sending an unadulterated goodnight text to you. Beware of fake and cheaper texts! I love you so much. 9. Let’s go to bed my love, we will meet up in our dreams. I will bring the wine and cookies, while you bring the blankets! 10. I wish you an enjoyable sleep, free of Dracula in the form of mosquitoes! 11. Today is world sleep day, but tomorrow is world wakeup day! Have a sound sleep! 12. Each night I go to bed, I pray you do not wake up screaming and running as a result of nightmares or a rat on your bed! 13. Goodnight to the star of my night! See you tomorrow! I love you. 14. The thoughts of you make up my night. I love you, darling. Have a good night. 15. I am already excited to tell you how my night went! So I will just head straight to bed now. See you in the morning! 16. Every night I dream of you, it becomes the best night! So I am looking forward to having a good night. Sleep well, honey. I love you. 17. Knowing that I have you to sleep next to each night, is amazing! Have a lovely rest babe. 18. I am in love with you and no one else, so I cannot wait to dream of you and no one else! 1. It is time to go to bed, so get ready to hit the hell out of that snooze button! Goodnight baby! 2. Isn’t it a shame to have me but to cuddle all your pillows! Good night my dearest! 3. It is a really good night because we get to sleep our worries away! Sleep well! 4. The best part of the night is when we get to close our eyes to our reality and open our eyes to our dream world! So enjoy! 5. I am texting you so I can fill up your thoughts before bed because that is a good night’s guarantee. 6. Goodnight baby! I wish you positive dreams that will make you want to get out of bed the following morning. 7. Have a wonderful sleep and that is an order! 8. Have yourself an amazing night’s rest tonight for if you do so, I have got a present that awaits you tomorrow morning. 10. To fly, make friends with the birds, and to sleep, make your bed your friend! I already made mine! 11. A lovely night to a lovely boyfriend! I cannot wait to see you in the morning! Love you! 12. Would it be selfish of me to say I look forward to your hugs and kisses this night in my dreams, and tomorrow morning when I wake up? I guess not! Love you! 13. May God bless your night with tons of good dreams and strength to wake up tomorrow morning. 14. I wish you a good night free of nightmares, and be rest assured that you are the love of my life! 15. Think of me while you lay on your bed and go to sleep, so you can smile in your sleep and scare away the nightmares. Goodnight my love, sleep tight. 16. Have a marvelous rest. And that is more of an order than a wish!! 17. My love for you is brighter than the moon and the stars that watch over us at night. Goodnight my love. 18. You are my knight in shining armor that will slay all the dragons that come after me in my sleep. And I am your knight armor to slaying your own dragons too, good night. 1. Have yourself an awesome night’s rest, for I can assure you that there is no monster living under your bed! 2. For as long as the sky is going to be blue the next morning, you will have me disturbing you throughout the night! 3. Goodnight sleepyhead! –from your sleepyhead boyfriend! 4. Have a good night on this very cool night. I promise you this- no vampires will kiss your neck! 5. Very soon, we shall conquer the world! But until then, I will just go to bed. Goodnight my lover. 6. The skies are blue, the leaves are green, I am going to bed, and roses are red! 7. I have surrendered to the night with both arms up in the air! The night can take me wherever it wishes in my dreamland. So you should too! I love you. 8. You are sentenced to eight hours of compulsory rest! Good night my darling. I will always love you. 9. It is time to confiscate your gadgets and appliances. It is time to go to bed. Good night babe. 10. This is a reminder that it is Sunday night… yeah, that’s exactly what I am thinking! Tomorrow is Monday! So rest well. 11. I look forward to your face at daybreak. So sleep well the love of my life. 12. Sweet dreams are what I wish you and more tonight, and on all other nights. Goodnight baby. 13. When you feel the cool breeze of the night, maybe it is the boogeyman blowing kisses to you! 14. May the Lord send down his angels to guide you as you sleep; mosquitoes and bed bugs have got nothing on you, my dear! 15. Out of service for about eight hours! Good night my queen! 16. You make my world go round; you are my thoughts in the day, my thoughts in the evenings and my dreams at night. I love you, honey. Goodnight. 17. My days are perfect with you in it, and so are my nights when I have to dream about you. Have a splendid night’s rest. 18. Thank you for scaring away the nightmares by remaining in my thought and dreams throughout the night. Have a good night yourself, baby. I love you so much. 19. The darkness of the night is here to overcome our fears. The moon and stars are here to lead us in our dreams. Goodnight my sweetheart. 1. I am not there to drag you straight to bed this beautiful moonlight, but have this: good night! 2. A deep breath is a good start for the night, so my friend; do not forget to brush your teeth at night! 3. Good night, kill some mosquitoes, and sleep tight! 4. Dear moon, now that you are up, can you please stay much much longer so that my friend can have the best sleep? Thank you. 5. Goodnight to the only friend I have who is probably still awake while the world sleeps! 6. Hey, I can now fly without wings, and eat the biggest hamburger and not get fat! How? I am going to my dreamland. So goodnight to you. 7. Make sure you have a good bath before bed because the sheets and pillows deserve a good night too! 8. My heart is in a pizza box because it is the last thing I think of at night! What about you? Goodnight! 9. Take this little piece of advice; wear the same bed sheet and pajamas and no one would think you haven’t gotten up! So good night and good luck! 10. Even computers and internet applications now have a ‘night mode’ so, respect the night and head to bed! 11. Night time is the time meant for hard workers to have a good rest. So you go ahead. 12. Every night brought to us is a blessing, so get rid of the boogeyman and ghosts thoughts, and have a good sleep. 13. Inspirational quotes do not get me out of bed as quickly as the rats do! A good night to you. 14. Let my snoring serve as a lullaby to you as you sleep, and also distract you from the nightmares! Goodnight dear friend. 15. May you go to bed with God’s light of love, a veil of protection, and showers of blessings. Goodnight my beloved friend. 16. You deserve nothing but a good night’s sleep after your well-executed role of a best friend during the day! Goodnight dearest. 17. As much as I would love to wave away all the mosquitoes while you sleep, I wish you a bite free night my dear! 18. There is going to be a big surprise for you under your pillow when you wake up in the morning, only if you have an amazing rest! 3. Good night my love, you are the one I have always pray to spend the rest of my life with, thank God I found you if I had known I would have searched for you long ago, every moment with you is memorable. Love you. 4. I can’t do without you, my husband. Honey you mean a lot to me, you are the apple of my life.good night. 5. My darling husband, I will never love another person sweeter than you, my love my everything, you are all I want. Good night. 6. You make me happy, I don’t mind spending all my time with you, I wish you good health and happiness my darling husband. Good night. 7. You are so wonderful that I can not compare anyone to you, you made me understand the meaning of love, and you are the best lover ever, goodnight my dear husband. 8. I want to love you forever, I want your love too, I can die without you in my life, so please I need more of your love and affection. Good night. 9. I can climb the highest mountain to scream your name my husband; your love is sweetening my heart. Good night. 11. You are all I think of, I sleep all night and dream of you, you can’t imagine how I feel about you; even words can’t explain how I feel for you. Good night love. 12. My sweetheart, what can I do without you, you are my joy and my hope; I will love you tonight, today, tomorrow and forever. Goodnight. 13. My husband and only one don’t leave me, I can’t leave a day without you, you are the one I love and you will always be my number one. Lovely you, you are my true love, you inspired me, you give me all I ever wanted, you are so handsome. Good night. 14. Happy to have you in my life and also happy to know you are meant for me alone. I love you. Good night. 15. My dearest companion, I love you because you love me and am glad you are mine. Good night Love you so much. 16. I have true love in you and I have realized life is worthless without you my husband, good night my sweetie and have a lovely night. 17. Loving you my husband is like food to my soul, I want to be that special person in your life, I want you to share all your secret to me because am going to keep it safe in my heart. You mean a lot to me. Have a sound sleep, good night. 18. Good night my sun shines my everything, in fact, you are the air I breathe, and without you, I will be nothing. Love you. 19. My dear husband, I love you not for what you are but for what I am to you, I will be the sunshine you see you. Have a wonderful night. 21. I have been thinking about how life will be without you, you are all I see in my dreams, and hope these feelings last forever. Have a peaceful night love. 22. I will love you my husband till the end, you would not understand the way my heartbeat when am with you. The man behind my happiness. Wish you a good night. 23. I love you yesterday, I love today, I love now and tonight, I will love you tomorrow, my sweet husband. Good night my love. 24. My Mr. handsome, you are making me go crazy, your looks and smiles kill my nerves; you are just the one I want and love. Good night. 25. The only one I keep talking about, you are incredible, and your touch and kiss take me down there where I really like to be. You are my source of happiness. Good night. 26. Its another night and I like the way you look at me, I like the way you say my name, I like everything about you, you are my everything love. wishing you a restful night. 27. My husband, honey pie, sugar bunch you are amazing and deserve the best, let roll in love and swim in the ocean of love, I will keep my promise, don’t worry, am all yours forever. good night and Love you. 28. my love, let the light of love on and I will keep the light of love burning, the love you have always wanted is yet to be explored, you are my everything, I will never leave you, love. Wish you a good night. 29. I am indebted to you, I can’t be if there is no you, you are so amazing and wonderful, you are my dream come true, love you, darling. I wish you a super good night. 30. My love, let me be the woman that will care for you, the woman that will give you everything you want I, the woman that will hug and kiss you and the way and manner you want is me, just let be the woman in your life. Sweet night love. 31. You and I are meant to be together forever, you owe my heart and I will love you for that, you have occupied the empty spaces in my life, my love for you is forever. Good night my love. 32. It’s a lovely night and I will love you forever, I will never love another, the way I love you, you are the only one I think, you are my everything, I promise to be yours forever. Good night. 33. Good night and happy to know that you are mine, I am so jealous that even flies should not perch on you, you are my sweet lover. Have a lovely night. 34. I have enough space for you in my heart, my husband, my arms are wide open for you at all time, I want to be the one you can lay on when you to lie, loving you is the best thing in my life.wish you a night full of pleasure. 35. I love you more than you could imagine, I will not let your love down, I promise to be there forever, love you. Am not going to stop dreaming about you tonight, you are the main subject of my life, I will love till the end of time. With love, I say good night. 37. Good night my darling husband, not until I meet you I believe in dream come true, you are a priceless jewel, my love is for you or never. 39. Having a good night is a wonderful experience when they talk about love; I smile because I know how it feels to be in love because of you. Your gentle touch makes me scream for more. I will love you always. Good night. 40. Goodnight to my wife, the beauty my life, my life will be so boring and meaningless without you; you are so special and deserve all the best in life. 41. I can’t think straight without you, you are all I see and think of, you mean the world to me, my love for you grow beyond your imagination. Love you. Good night my love. 43. Its bedtime and relaxation time I have always believe in you and I trust you, so don’t let me down because your love is killing me slow, slow and I want to be with you always. Love me more my sweetie. Good night. 44. Am not going to stop dreaming of you tonight because my night is going to be peaceful, and I will think of you all night because my day is splendid with you in my mind. good night. 45. Life is beautiful with you, and life will equally be scanty without you, you are so lovely and fun to be, love you my dear. Wish you lovely wife a wonderful night. 46. I love you for who you are and not what you are; you are irreplaceable in my heart. 49. My heart beats for you loving wife, you are the source of my happiness, I will love you till the end. You remain my number one. Good night sweetie. 50. I can not sleep, I can not eat without your presence, you are my soul mate, and you mean more than the world. Good night loving wife. 51. The more I see you, I love you, the more I touch you, I feel the love and beauty of having you, love you, my wife. Good night. 53. Calling you my wife is an understatement you are more than a wife, you make me a real man, you inspired me, I love you so much. Have a pleasurable night. 54. I want you just flora need rose, I want you just like birds need their nest, I am so used to you now, I can’t let you go. Good night my love. 55. My love for you makes me go crazy, anytime I see you my heart beat, I love you till the end of time my wife, good and sweet night. 56. Life is beautiful with you my wife, you are so fun to be with, I am so glad we met at the best place and the best time, you are my joy, love you, my superman. have the best of the night, good night. 57. I see so many good things coming my way because you are in my life, your luck shine on me, I am so fortunate to be with you. 58. Make me your love and I promise to give you all my heart for the rest of my life. You remain my number one, and I will be with you forever. 59. In my heart, there is nothing compared to you. I have searched all over but could not find someone like you, you are so amazing. 60. I love everything you say to me, everything you do to me, I love you because I love you and I will keep the love growing higher in my heart. Lots of love my love. 61. I boring life would have been without you in my life, my existence would have been long forgotten if not for you, and you are the only man who presses the best button in my life. 62. I have all it takes to make you happy because your happiness is what I care for; you are the reason for my happiness too. love you. 63. I want to be in your arms all the time, I want to love you more than anything in this word, you are my dreams come true. 64. If I close my eyes is your handsome face I see, the only face I want to see first in the morning, you incomparable, your love is special, I love you. 65. My world is a lonely place without you, you are the missing rib, I have finally found you now, that makes me a complete woman, with you is with everything. 66. I have the image of you, a long time ago, you are not just a dream come true, but a destiny to come my way .i love you. 67. I believe in love at first sight, it takes two tangles in the feelings, I have strong feelings and affection for you, and you are the sugar in my tea, my honey, my love. 68. You make me feel the way I feel, you show me how to love and I can’t stop loving anymore, I am happy I am in your arms.